The wait is over. 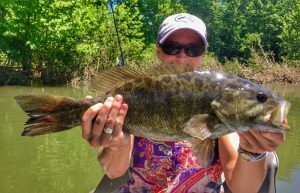 Most Virginia rivers are back down to great fishable levels and the smallmouth bite couldn’t be better. 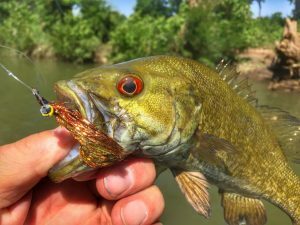 Although we once again missed most of mid April-mid May the post suspension/prespawn window the big smallmouth bass are still very angry and hungry. Here is the story of what happened on the Shenandoah that day. The Doah had been very high and I always do a test float before I float clients. First and foremost I check to be sure the river is safe. Second, find out how the fish are behaving. Just like many of you, I have been chomping at the bit watching the flow charts for a few different locations on the Shenandoah river. Even though the gage height was a little on the high side I thought we had a chance of pretty good visibility. Was I wrong. Chocolate milk. Very high, very fast moving chocolate milk. Plan B. Head up river to another location. I double check the gage for that location, not only was the gage showing it wasn’t high, it was on the low side of the flows I like. Strange. Oh well. I know that stretch fishes well in low water. We make the short drive up river to quickly realize something is not adding up. Standing at the launch I pull up the USGS gage again. It is clearly wrong. Not only are the flows not low, they are pretty/very high and not exactly chocolate milk, rather very dark tea. I look at my girlfriend and buddy Vic and say, well it’s a beautiful day, we have some good sandwiches and a cooler of drinks. I think it’s going to be very tough fishing but it will still be a fun day floating down the river. They are both up for it so we drop the boat and off we go. As I’m picking out and tying on flies for them I mention if we catch a fish today I will be surprised. It wasn’t very long after that statement that I realized everything I said was right and wrong. I was right about us having a great day. I was wrong about us not catching fish. Just a couple minutes into the float, Vic catches a nice little smallmouth bass. That got the skunk off the boat and gave us all hope that maybe just maybe we might catch a few more. As the morning and float progressed Vic caught another small one Sally had a couple hits but it was pretty slow going. I’ve been trying all the tricks and spots I know and although we’ve caught a few fish on a day I didn’t think we’d catch anything of course I’d like to see more fish. We drop anchor and have lunch. After some food and drinks I pull up the anchor and as I had said a number of times before during the day, We’re going to try a spot right over there. I’ve seem some very nice fish over there. As I put the boat into position Sally casts and gets a hit but missed the hookset. A couple casts later hit, sticks the set and boats a beautiful 20+” smallie. Awesome, congratulations to Sally on her first 20+”er. As Vic and I are still telling her what an amazing fish she just caught she’s right back to casting. A few casts later she sets the hook again and all I see it a flash and it looks like she has an even larger smallmouth on. The fish runs away from the boat. We haven’t gotten a good look at it but the way it’s fighting it sure seems bigger then the last one. As she fights the fish back to the boat it comes up and roles. 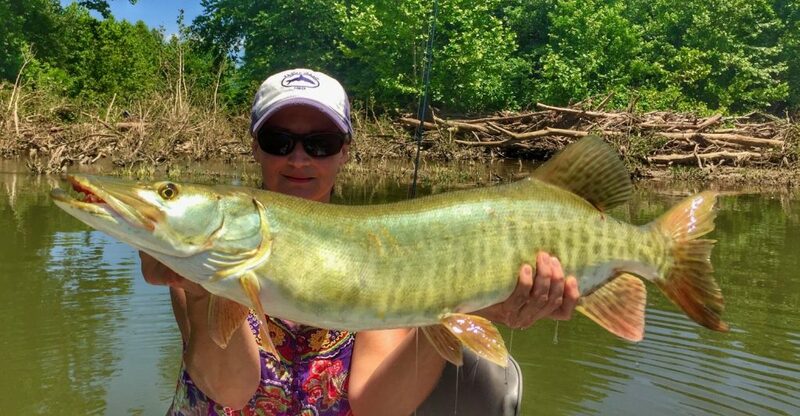 We both see it’s not a smallmouth, “oh s***, it’s a musky”. 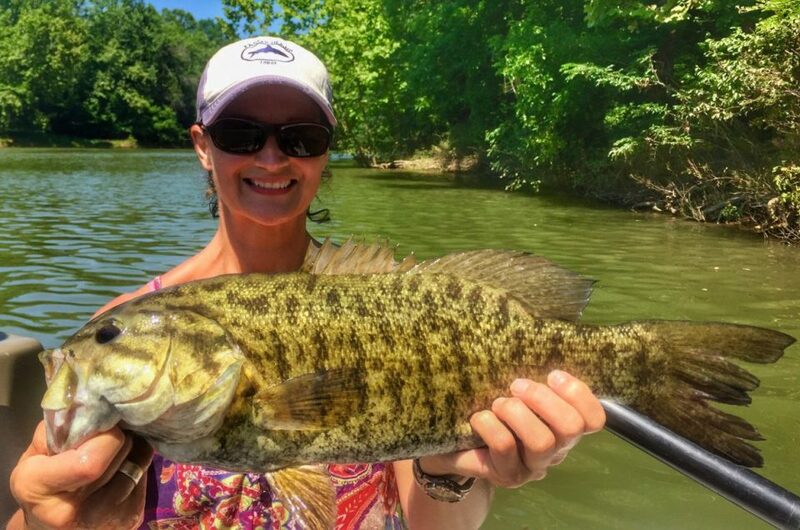 She’s saying “oh s***” because she’s hooked into a musky, I’m saying “oh s***” because she’s hooked into a musky on with a smallie fly on 12lbs tippet in June. The good thing about the crazy weather we have had this spring is, the water temps that day were below 70 degrees thankfully. I really don’t like seeing musky hooked in warm water. It does happen and breaking off as soon as you can is the best thing for the fish. I really did not want to tell her sorry, you need to break your musky off. That could have made this great day go bad very quick. During the summer moths musky will hit smallmouth bass flies. It is a heart breaker but breaking the fish off and leaving a fly in its mouth is much better for them then fighting and landing them in warm water. Anyways, it was a great day in every way an angler could want. The smallie fishing is great right now. 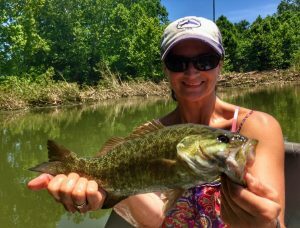 If you’d like to join us a smallmouth float give us a call.